New England coyotes are bigger than their cousins on the Western plains, and often have russet coats. They look more wolflike. Now research suggests this is because they hybridized with wolves as they migrated east over the last century. The mixing of coyote and wolf genes allowed the animal to rapidly evolve larger, more powerful jaws, better adapted to preying on whitetail deer. One Massachusetts biologist says the animals deserve a new moniker: coywolves. The genetic mixing is also giving federal regulators headaches as they try to figure out which creatures need protection. Coyotes are recent arrivals in the eastern United States, colonizing the habitat over the last century after native wolves were killed off and forests cleared. In a paper published this month in the journal Biology Letters, Roland Kays, curator of mammals at the New York State Museum, shows that the coyotes that migrated east through Ohio were not as well adapted to the Northeast as those that came through southern Canada, hybridizing with wolves en route. Kays says the hybridization gave northern-migrating coyotes the evolutionary edge over the southern-migrating population, allowing them to colonize the region five times as fast. Not only are the Eastern coyotes bigger than their Western cousins, they have more varied coloration, which Kays said “can happen just from mixing up the coyote and wolf genes.’’ In addition to the typical gray coats, many Eastern coyotes are reddish. Kays said some even look like German shepherds, but do not carry any dog genes. Biologist Jonathan Way, who tracked coyotes around Boston and Cape Cod for years while earning his doctorate at Boston College, wrote a paper on coyote genetics for an upcoming issue of the journal Northeastern Naturalist. Way said Eastern coyotes are so distinct they deserve a new name. “Whether you are up in northern Maine or down on Cape Cod, they are absolutely hybrids,’’ said Way. “I just don’t think calling an animal that’s a hybrid one species name, i.e., coyote, is appropriate.’’ He proposes the name coywolf. But Kays considers the Eastern population a race of coyote, much more coyotelike than wolflike. “This is a very dynamic process, and to start putting names on things now is not appropriate,’’ Kays said. Michael Amaral, a biologist with the US Fish and Wildlife Service who specializes in endangered species, said that a related genetic puzzle is complicating things for federal regulators. The service protects the gray wolf (Canis lupus) and the red wolf of the Southeastern United States (Canis rufus) under the Endangered Species Act. But the emerging genetic picture shows a confusing continuum among wolf and coyote species. 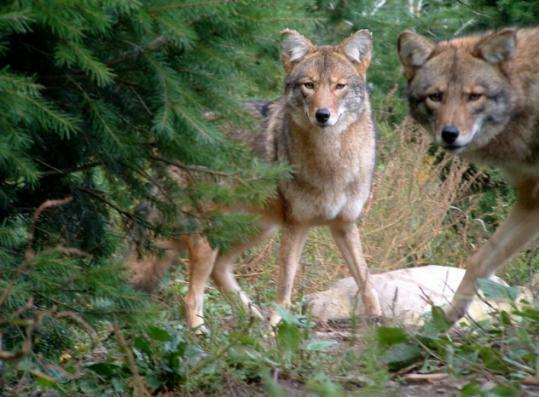 Western coyotes (Canis latrans) and gray wolves bookend the group. In between are the Eastern coyotes and the smaller wolves known as Eastern Canadian wolves (Canis lycaon), a type that some biologists say is a distinct species closely related to red wolves. The thriving wolf population in the Great Lakes region shows mixed genealogy. Further blurring the wildlife management picture, coyotes can be legally hunted in unlimited numbers throughout New England, while wolves are federally protected. Meanwhile, wolves seem to be trickling back into their onetime New England stamping grounds via coyotes, regaining their ecological niche one gene at a time.